If you have been to Tekka market, you will find row of stalls selling lamb. Piles of tulang greets you as you approach the stalls. As with beef or pork; it is a head to toe thing; from tough to tender cuts of meats, suiting many different type of recipes and cooking techniques. My favourite cuts are the small ribs (about 20 per kg) and the chops (about 26 per kg). "No, no, huff an hour okay. No one hour." the Indian butcher replied, shaking his head for emphasis and dispelling the notion that mutton or lamb needs long hours of cooking. These ribs and chops should be delicious in any kind of curries. I have always wondered how it will taste with buah keluak paste. Having cooked it a few times, I will definitely give it a thumbs up. Whether on the home or a restaurant table, it should be an amazing dish. 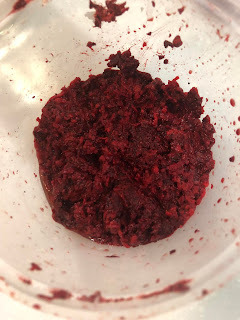 Now, the key to a good buah keluak dish is to make a good buah keluak paste, of course. As I have said elsewhere, I buy ready prepared buah keluak flesh from the dry good stalls at Tekka market. If you want to prepare them from scratch, that will be fine as well and the cost will be cheaper. The other ingredients you add to the buah keluak flesh depends on what meat you are cooking it with and what dish you wish to make. If I am making it with pork belly and want to make a buah keluak variant of Toyu Bak, I add more garlic. Ginger always goes well with lamb or mutton and so, for this dish, I will add more ginger. I add soy sauce for the salinity and gula Melaka or sugar for the sweet. Then some assam paste for the sour. 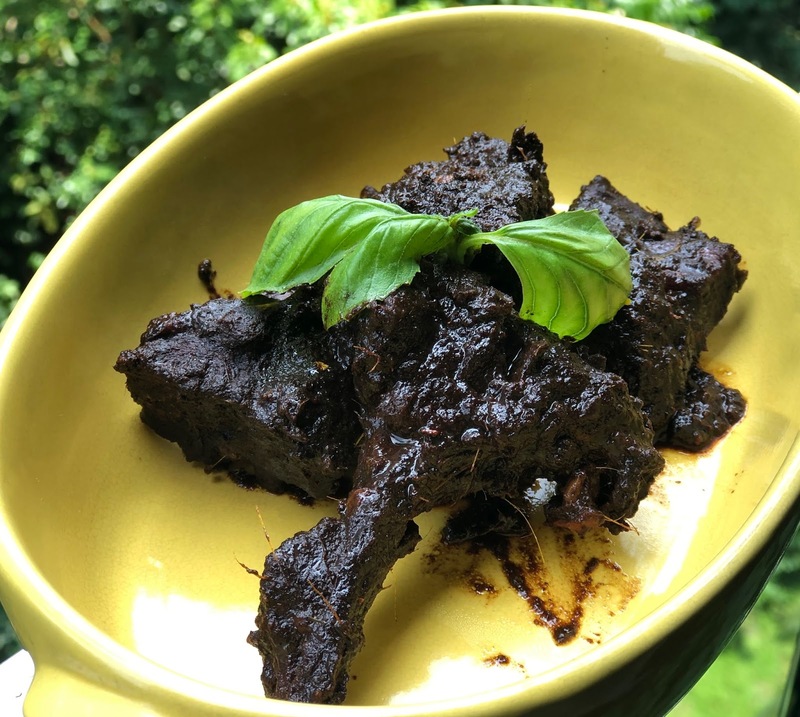 Crushed black pepper and lime juice will be a good way to complete the dish just before it is served and garnish with some herbs like basil, coriander leafs or kaffir lime leafs. 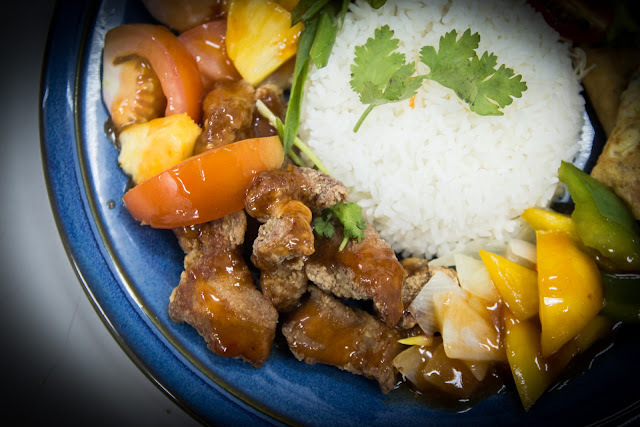 Except for the meat (of course), the rest of the ingredients are local or Southeast Asian. The technique for this dish is similar to making curries and if you are familiar with curry making, this is a no brainier. For garnishing: sweet basil, coriander leafs or kaffir lime leafs. 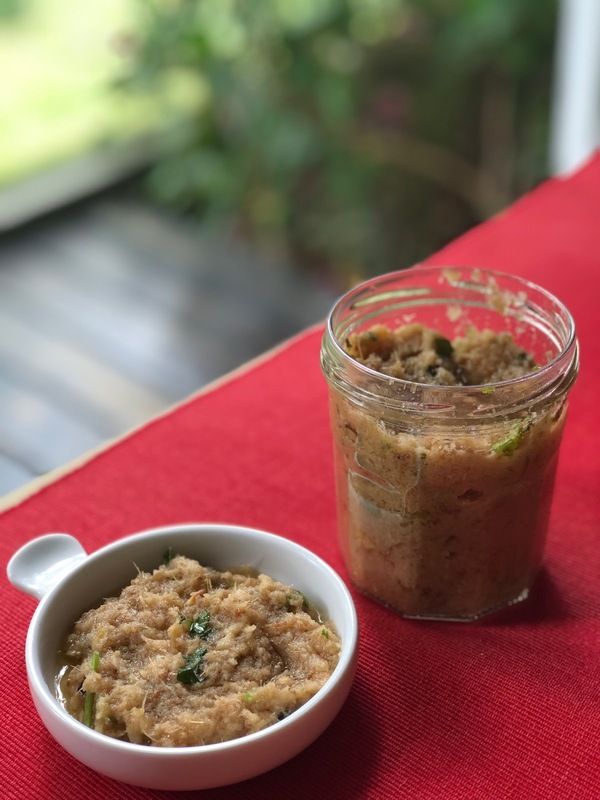 Using a blender, blend the herbs and buah keluak flesh into a paste. Heat up the oil in a wok. Add the paste, gula Melaka, soy sauce, Assam paste and simmer for 20 minutes. Add the ribs/chops and stir. Then add the water and simmer for 30-40 minutes till the meat is tender (but not falling apart). Adjust the taste further with soy sauce or gula Melaka or sugar if needed. Add the crushed black pepper corn and squeeze the lime juice in and stir. After simmering, t he dish is done. You can cook this way before dinner time as this dish keeps well and the taste gets deeper with time. This dish is best serve warm or at at room temperate. Garnish with any of the green leafy herbs before you serve. If you are using Kaffir lime leafs, dice it up. Basil and coriander leaves can be used whole. Eat with hot steamed rice. Local, delicious and unusual. There are many reasons to like this dish. Everyone in once in a while, church members will give me a bagful of green belimbing fruit. This longish oval sour fruit has a pretty bright green colour which turns yellow and will soften if it is too ripe. It is best cooked when it is still green and firm. Colour and taste-wise, it is a perfect combination with prawn sambal. You can cut the fruit in thin slices or halves. Some will even cook it whole. It cooks fast and so, you need to vary your cooking time according to it's size. 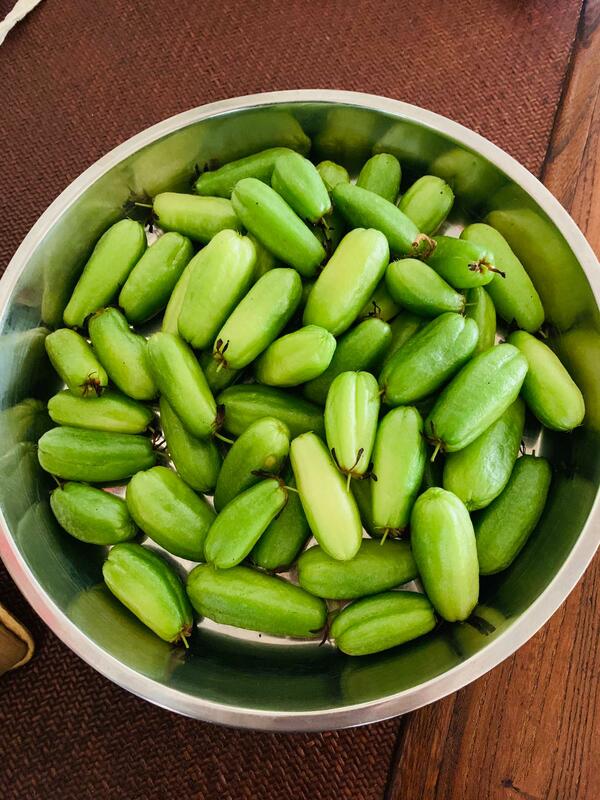 There is an interesting post on this fruit here. This recipe is simple. 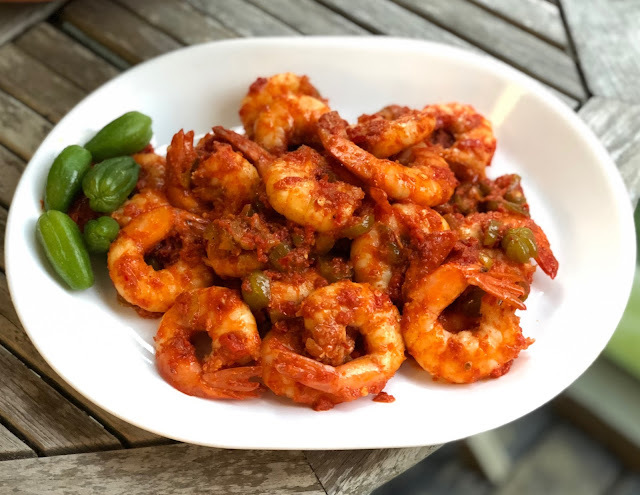 You cook the prawn sambal first and then, you add the belimbing slices and stir for a further minute before you dish out. Use fresh prawns. The prawns need to be cooked quickly. If you cook it too slowly (i.e. with oil that is not hot enough or by overcrowding), the meat will not be firm. 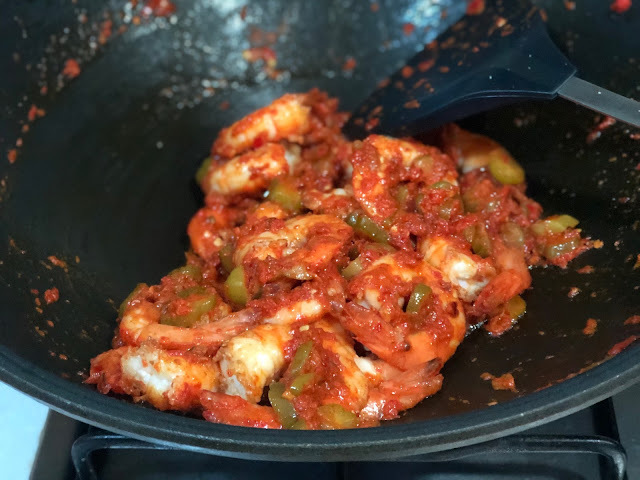 So, make sure the sambal you have cooked is hot before you add prawns to it. If you are cooking a large portion, I will recommend two-stage frying. Use some heated oil to quickly cook small batches of the peeled prawns. Then you use the same oil to fry the sambal before coating the cooked prawns with it. 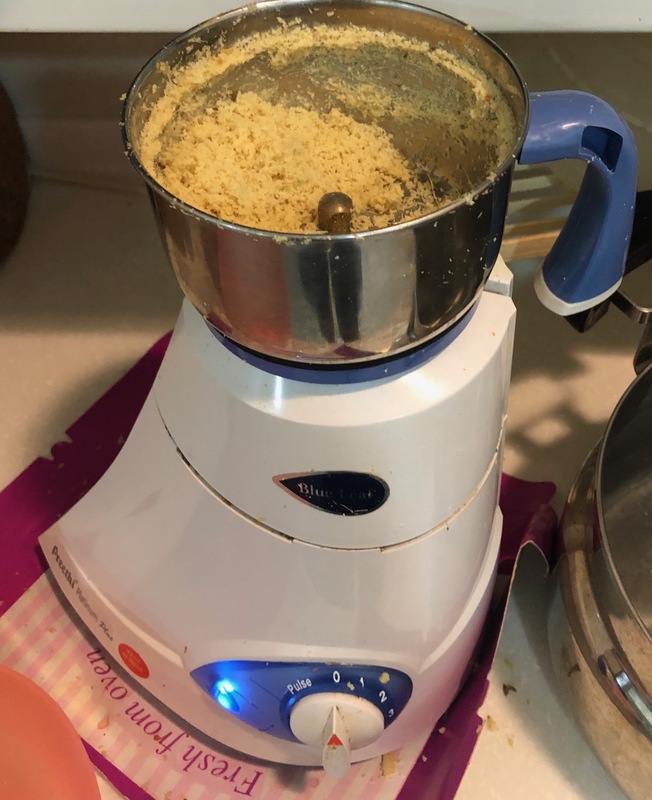 The recipe below uses this approach. Peel the prawns. Marinate the prawn meat with 1 teaspoon each of salt and sugar before dusting with the cornflour. Refrigerate for 30 minutes. Meanwhile, you prepare the sambal. Soak the dried chillies in hot water for 10 minutes. Remove and blend along with the fresh chillies and sliced lemon grass. Toast the piece of belacan in a dry pan or wok over low fire for a minute. Set aside. Remove the prawns from the fridge and rinse off the cornflour and shake off excess water. Heat up the 200 ml of oil in a wok. Fry the prawns in small batches till they are golden orange. Set aside. Add the chilli paste to some of the leftover oil and simmer for 10 minutes. Season with salt and sugar to taste. Put the prawns in with the finely diced kaffir lime leaves and toss it in the wok for a minute. Add the belimbing slices and toss for another minute. . 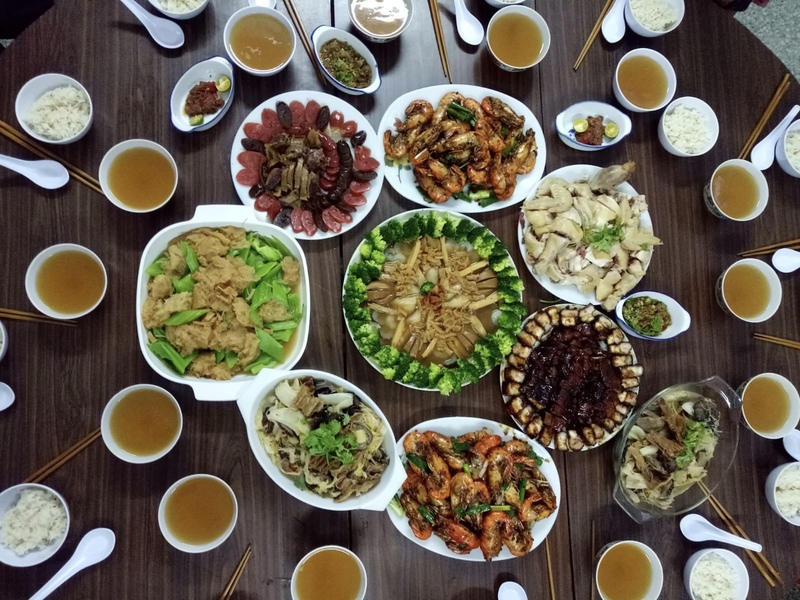 This dish can be served at room temperature and enjoyed eaten with hands in the traditional Asian way. Sometime last year, we had the privilege of visiting a some good friends in Kuching who hosted us to a wonderful family holiday. One of them is a foodie to the boot and we were introduced to some interesting food and produce. As expected, Foo Chow cuisine is a prominent feature here. In early 20th century, Foo Chows from the Hokkien province of China braved the seas of South China and landed in port towns like Sibu. Lured by their clansmen, they were promised fortune and wealth. The Foo Chows were hardy and laid their hand son jobs like farming and rubber tapping. Gradually more Foo Chows came over. Eventually, some ventured into the lucrative timber business and till this day, Foo Chows control much of the timber business in Sarawak. All these was happening under the controversial colonial rule of the James Brooke and "white rajahs": a dark chapter with an impact which still lives on in the beautiful islands of Borneo. Enough about the Foo Chows or colonial politics but let's talk about food. One of their famous dish is "angjiu" or Foo Chow Red Wine. 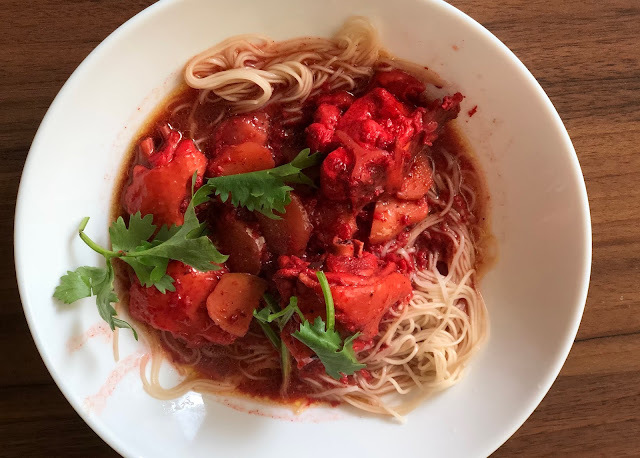 Red Glutinous Wine Chicken and Mee Sua is a popular dish. When I was in Kuching, I could easily buy good red wine and lees. They keep well in the fridge. You can also put the less in the freezer. If you have both, making this dish is really easy. 200 gm of ginger, slice. 3 tablespoon of red wine lees. wood ear fungus and stir. Then, add the chicken pieces, salt, sugar, soy sauce and mix. Pour in 200 ml of wine and simmer for 305 minutes, stirring occasionally. Towards the end, our in the remainder red wine. Adjust the taste with more sugar or salt, if needed. Garnish wiht coriander leaves before you serve. You can eat it with rice or noodles like Mee Sua. There are other ways to use the red wine and lees. Stay tuned for future recipes. Dipping sauces often plays the second fiddle, accompanying the main dish and eaten on the side. If you take a food photo, the small plate of sauce is likely to be blurred or "bokeh-ed" out in the background as the meat dish takes center stage. But there are times when the dipping sauce is so good that it becomes the reason why you keep dipping something with it. My mums favourite ginger sauce always accompany her Steamed Chicken during CNY reunion dinners and on other occasions. And the sauce always ran out way before the chicken was eaten up. She has never left behind a recipe but from palate memories and some experiment, I have settled on this recipe. One key ingredient to this sauce is galangal. I have come to appreciate the versatility of this ingredient through Thai cooking and Chao Shan Cuisine. I was very inspired by how Chao Shan cuisine uses galangal through Netflix's Flavorful Origins series on this cuisine. 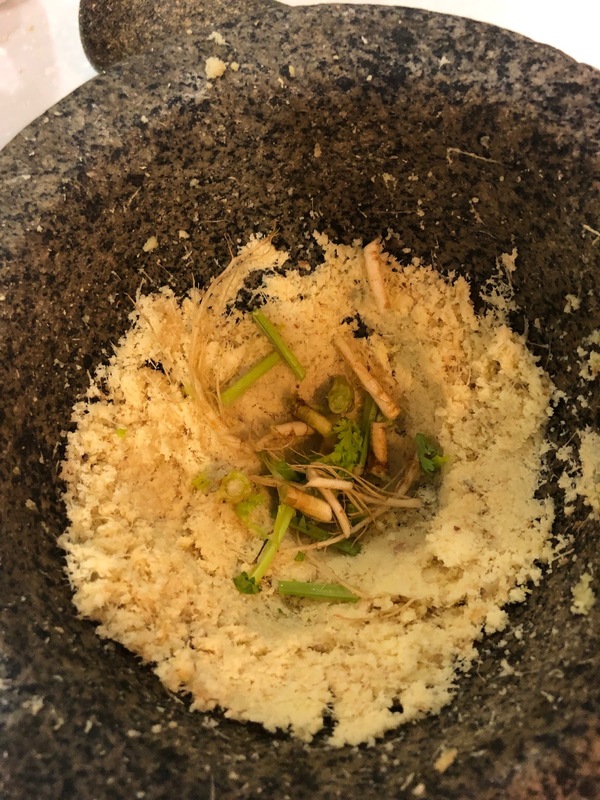 If you are cooking a small amount, using a mortar and pestle is the way to go for the smashed texture. (read my inserting satire on the "Rock of Ages"). However, most times, I prepare a large amount of this sauce. It is more practical to grind it coarsely in a grinder and the finish off in the mortar. Old galangal can be as hard as a rock but a good grinder (I use the Sumeet Mixer Grinder - this is the best for Asian cooking, Panasonic also makes mixer grinders) will make short work of it. If you want to grind everything in the electric grinder, that is an acceptable compromise. It is important to squeeze the ginger juice out before you fry it so that the ginger will caramelise faster. You ned a lot of oil for this sauce to work. And it is also important to add enough salt. Apart from Galangal, I add normal ginger, coriander roots, stems and leaves. Adding the ginger juice and chicken stock (handy if you are boiling soup at the same time) towards the end of the cooking will help to make the sauce more viscous. Here is the recipe. Trust me. You won't regret learning this sauce. 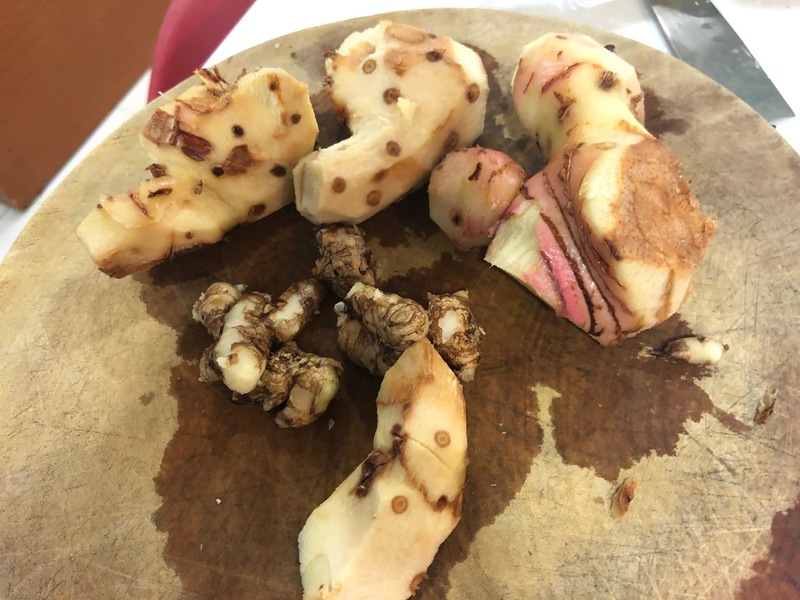 Pound or grind the peeled galangal, ginger, cekur and coriander roots. Diced the garlic separately. In a wok or pot, heat up the oil in a small flame. Add the diced garlic and fry until lightly browned. Then add the ginger paste, salt, sugar and fish sauce. Simmer and stir occasionally for 15 minutes. Towards the end, add some cut coriander stems, leaves and dashes of Chinese wine. Then add some chicken stock and some of the ginger juice back in. Have a taste. Adjust with some salt or sugar if necessary. Simmer for 2 minutes or so and dish out. When it is cooled, bottle it up. It keeps well in the fridge for a few weeks. It is great as a dipping sauce for Steamed Chicken, pork or fish. Depending on the the size of the chicken, a 25-to 30 minutes of steaming will be sufficient. This sauce can be used for the Steamed Chicken in Ginger Sauce. My brother holding the late of Steamed Chicken which he has just chopped. Crunchy fried pork and a tomato-based sauce. What is there not to like about this dish? In fact it has. global reputation and you can find this in any Pan-Asian Chinese eatery in America, UK or Europe. It is surprising why it took so long before the recipe appears on my blog. One reason is because this is one dish which my wife have cooked a few times and I have basically let it stayed in her domain as I focus on other dishes. I should add that there was one version we ate in Nanjing (China) which we still remembered to this day. The pork's coating was firm and crispy. We have never encountered this kind of texture. What kind of flour was used to coat the pork before it was deep-fried? I suppose the experience has raised the bar for me and I will be on the lookout for tips that can get my version closer to that. I will share a recipe here which my church food team, helmed by Linda Ng (Linda's Cravings), cooked recently. As one can imagine, there are many ways to make this dish but I will introduce this approach where the pork is not coated in a thick batter. It will make for a lighter meal. Marinate the pork for 30 mins in a deep steel container. Cut the tomatoes, peppers and pineapple into bite size wedges. Add the flour mixture and coat the marinated pork pieces by tossing it in the container. 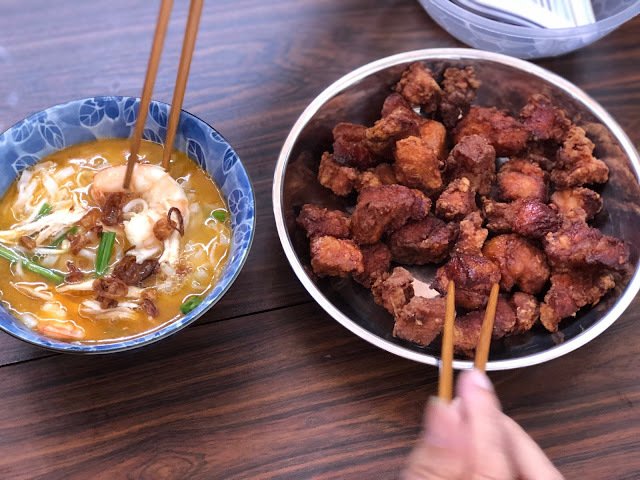 Using a wok, deep pot or electric fryer, deep fry the pork till they turn golden brown. If using a wok or pot, the fire should be medium. For an electric fryer, use 180˚C. Dish out and drain on paper towels. Mix the sauce ingredients well and adjust the taste if necessary if you prefer your sauce to be sweeter or more sour. Heat up a wok and add in some cooking oil. Add in the chopped garlic and stir fry until light brown, toss in the bell peppers, tomatoes and pineapple pieces. Stir fry until you smell the peppery aroma from the peppers and then add in the sweet and sour sauce. As soon as the sauce thicken, transfer the pork into the wok and stir well with the sauce. Do a few quick stirs, dish out. If you are cooking this way before dinner time, you can choose to fry the pork again (double fry method) just before you serve if you want the pork to be crispy. Do note that you can also experiment with different types of flour. There are ways to make a very crispy version but I will leave that to another post. 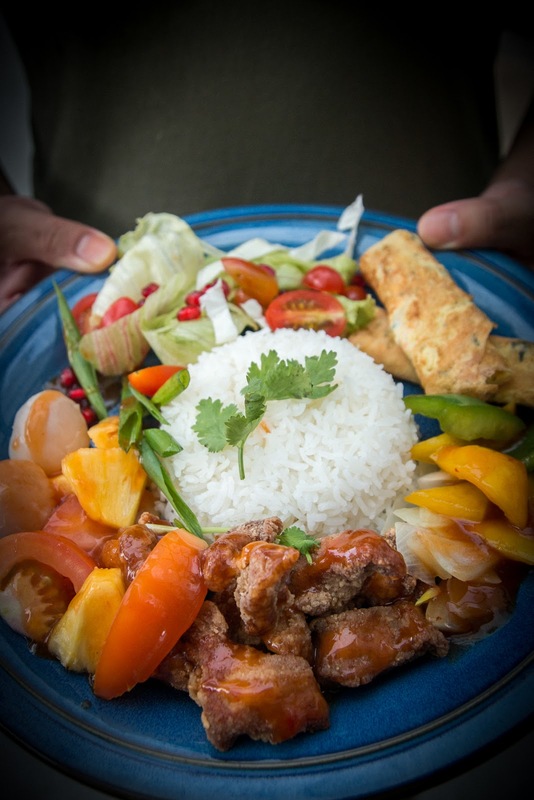 Photo below: In a recent party, we served sweet and sour pork with rolled omelette and fresh lettuce salad. 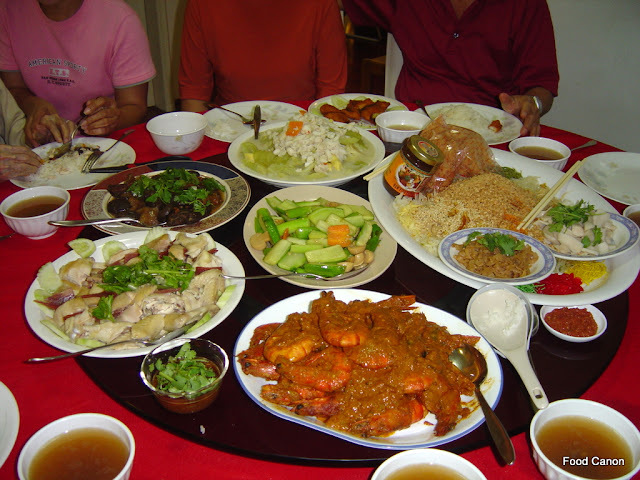 For the Wongs, undoubtedly, the Chinese New Year period is our most wonderful time of the year. We are gathered again in the place which houses so many generations of memories. It has the same cold floor made from a terrazzo tiles design which my grandparents and parents have paced, sat and occasionally slipped on. The wooden ceiling boards seem to have lasted many human lifespans. These boards were also floors for many generations of scurrying mice. Heard but not seen, they kept you awake in the middle of the night when the house was silent and still. The lights have not changed: the long and bright fluorescent tubes. “All or none”, it seem like led lights will not see the light of day here. The toilet and kitchen floors are perpetually damped, with water trapped in the mozaic tiles, a retro design which is coming back in recent years. Like “a river that runs through it”, it is the same place with so many generations and conversations passing through it. Relatives with grown up children in tow visit and chatter about the past. Some stories were repeated but there are always new tidbits which filled up the gaps in our family history. This year, the authorities have allowed the burning of certian types of fire crackers. I don’t know what is permitted but they are just a loud as those I heard in my childhood days. With a smokey aftermath, it is a familiar CNY atmosphere which you can hear, see and smell. 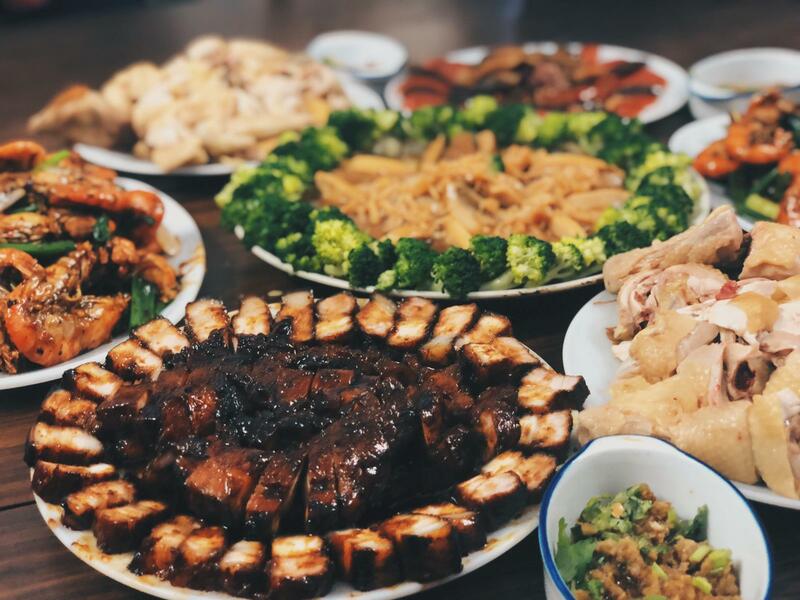 For the familiar CNY taste, many of the Wong dishes remains the same. 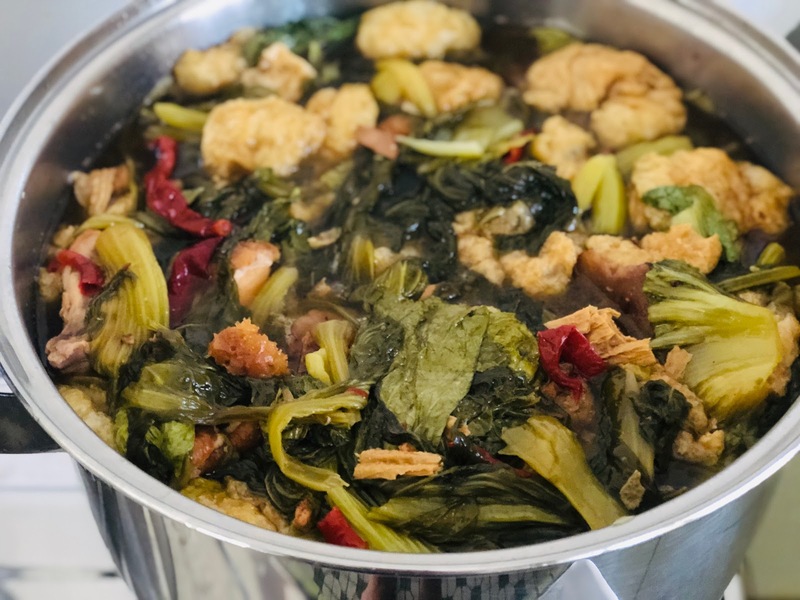 On the Reunion table, Chai Choy is mandatory and my mother’s version is always made from fuyi (white fermented beancurd) and wongbok (white cabbage). Mushrooms, bean curd sticks and meen kan is meat for vegetarians. Adding dried oysters lift it to another level though it ceases to be a vegetarian dish. Har Lok, stir fry river prawns with black bean, ginger, garlic and chili is another favorite. The size of the prawns seem to have shrunk with the years. The large wild caught one are very expensive and are normally booked by restaurants. The ones we have are of small to medium size and one tell tale sign of farmed ones is that they all came in the same size. Still, it is a familiar taste, especially when the heads are rich with eggs. Wok-cooked Char Siew was considered too “biasa” for Reunion. We cook it this year to welcome the Year of the Pig. Steamed Chicken is another staple, to be eaten with my Mum’s ginger sauce. I can recall how huge, yellow and fatty this “choi yim kai” (as my Mum will call it) but I can imagine some cruelty must have been done to those poor overgrown chicken. I heard in that in their last days, their legs and feet could barely support their weight. Nowadays, we use the large kampung chicken and they taste great too. At least we can enjoy it with a better conscience. As for the first day of CNY, my Mum will usually serve curry chicken and beef rendang. That is the nonya side of her. 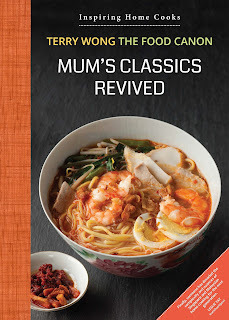 These days, we serve noodles like Assam Laksa or Ipoh Hor Fun, the latter quickly becoming my niece’s specialty (Janna Wong). Hakka Char Yoke accompanied the Hor Fun. Choi Keok (Chai Buay) normally appeared on the third day, using all the leftovers that have gathered over the three days. These days, we are impatient and it appears on the second. As we have the means now, we just use fresh roast pork and roast duck along with some leftovers. Getting the leafy Kai Choy is a challenge during CNY but my wonderful vegetable seller reserved 5 kgs of it, all grown in Singapore. I packed it in sealed bags and fridges it all the way. This hardy vegetables look just as fresh 6 day later. I have to wake up really early (5.30 am) to queue up for the roast pork and duck stall which is the lone stall opened only in the morning. He said he will sell till 12 pm but judging by the queue, I think by 7 am he can go home for his breakfast. I bought two kilos of pork and one duck. Along with some roast suckling pig parts kept in the freezer, I know two very good pots of Choi Keok is almost guaranteed. There you go. Our most wonder time of the year is almost over. At least for the Singaporeans anyway, who have to keep our economy going. The Malaysians will go on holidaying, eating and burning fire crackers till the end of the week. A very blessed and happy Chinese New Year to all of you! Our CNY spread in 2004. Mother's braised rib and mushroom dish is at top left. I am still undecided as to whether I should add this dish but it is definitely one of my Mother's CNY dish (in picture 11 o' clock). I used to help her to cook it in my late teens. I can still recall thinking that it was an easy dish to make. Perhaps this recipe can give you some ideas for your own CNY meals. First the dried shiitake mushrooms need to be soaked. As the pork ribs's pieces are about one inch square, depending on the size of your mushrooms, you may need to halve or quarter it. The sauce is made from garlic, light soy sauce, sesame oil, oyster sauce, dark soy sauce, crystal sugar dried scallop and Chinese wine. Soaked the dried scallop beforehand. In a deep pot, add some sesame oil and then fry the diced garlic. Add the crystal sugar. and dried scallop Then add the pork ribs and mushrooms. Pour in the sauces, a bit of water and stir. Close the lid and simmer gently. After about 45 minutes of braising, it should be cooked. Add the Chinese wine towards and some corn slurry towards the end. Meanwhile, blanch the pieces of broccoli for about 3 minutes. Don't over do it and ensure it is crunchy. When it is time to serve, on a large oval or round plate, line the broccoli on the side of the plate. 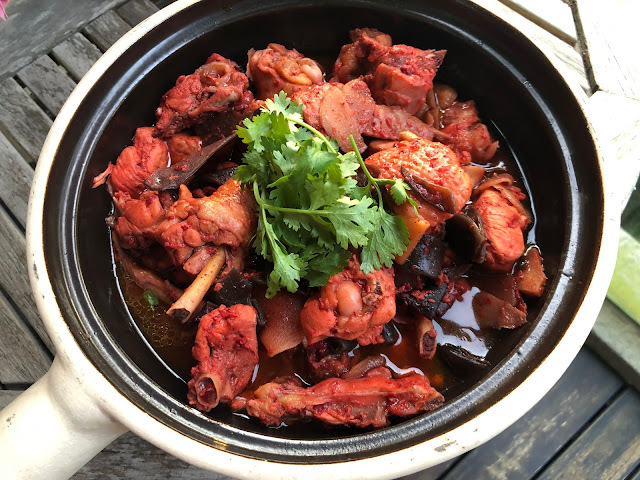 Ladle the pork ribs and mushrooms into the center of the plate and serve it hot. Pour the sauce over the meat and broccoli. We will be going back to Petaling Jaya this year to celebrate Chinese New Year. The planning is already in progress as we plan to recreate some of my Mum's specialities or family favourite dishes that we grew up with. As much as possible, we want to keep to "tradition." 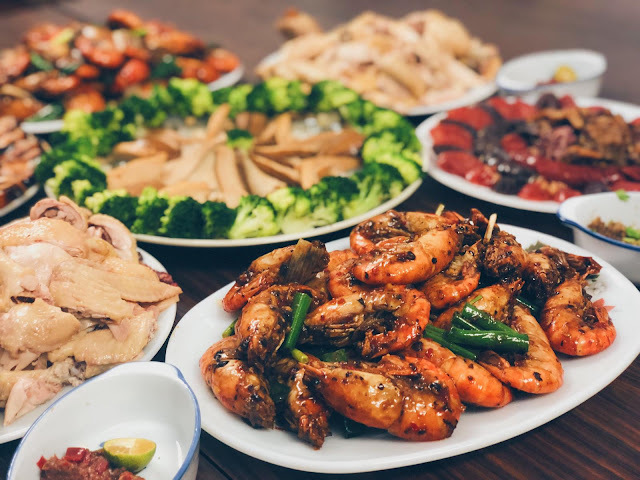 This means there will be dishes like Chai Choy (Vegetarian), Roast Pork, Steamed Chicken, Wok-Cooked Char Siew, Curry Chicken, Beef Rendang, Har Loke (River Prawns), Hakka Char Yoke, Chai Buay, Braised Pork Knuckle, Assam Prawns and so on. If you click on each of the dish, you will notice that I have blogged most of the recipes. Being the year of the pig, the pork dishes will receive some special attention. No surprises here. Let me start with the usual favourite: Wok-Cooked Char Siew. 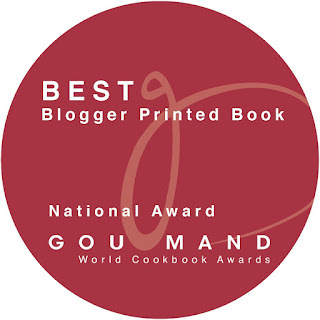 I have blogged the recipes here ad nauseam. I cooked it again recently when I was in London. I had to use whatever ingredients there was in my daughter's small apartment in London. 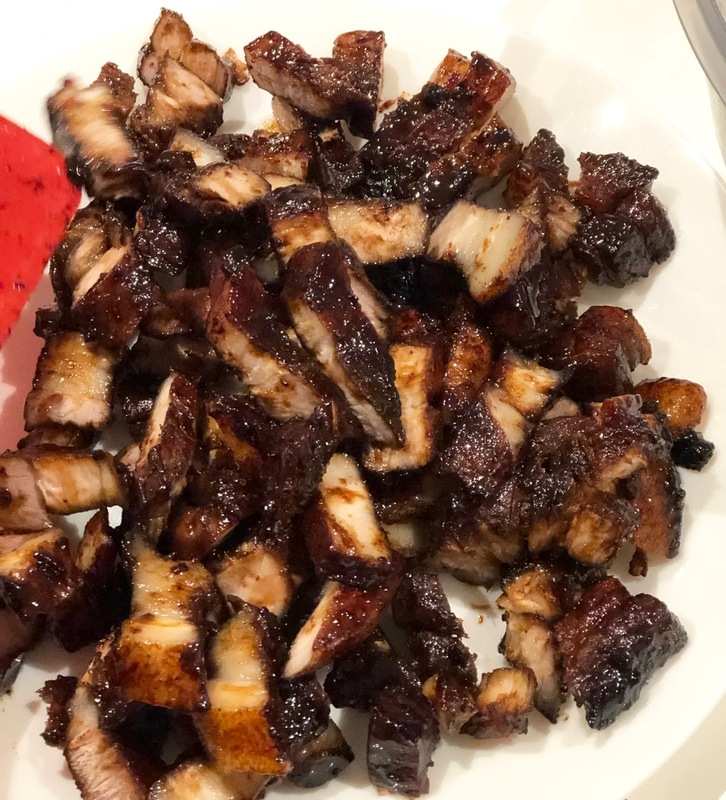 Char Siew is a funny dish: I may have cooked it countless times but I sometimes have doubts myself as I have to manage variables such as the type of pork, pan, fire, thickness of the pork strips, type of cuts etc. The advantage I have is that I am not stuck to a recipe. For example, timing. Should it be 45 minutes or 60 minutes? There is no answer to it. You have to cook the Char Siew until it is cooked. How do I know it is cooked? When it looks like cooked Char Siew! It can be hard to describe but you can tell from the softness of the meat, how "limp" the strip is when you move it around etc. It is similar to how we test the doneness of the steak, whether by tapping or just looking at the meat. The ingredient list included sesame oil, honey, dark soy sauce, salt and cinnamon powder. I won't recommend this list but it was all I could find in the larder. The dark soy sauce is not of the thick Malaysian type. Why cinnamon powder? I vaguely remembers that it was one of the spice used in 5-spice powder, which was not available in that apartment. But all I need essentially is : sweet, salty and sticky for Char Siew. I mix the ingredients first and satisfied that it tasted good enough as Char Siew sauce, I proceeded with the cooking. In a simple pan and using an induction hob, I laid out the pork belly pieces (about 1 kilo) and poured in the sauce. I added some water and got it braising, turning the pieces around ever so often. The distribution of the heat on this pan using a induction hob was unpredictable and something I am not familiar with. After about 60 minutes, I increased the heat and the thickening and caramelisation of the sauce being to happen. This is the "magic phase" of a wok-cooked Char Siew. 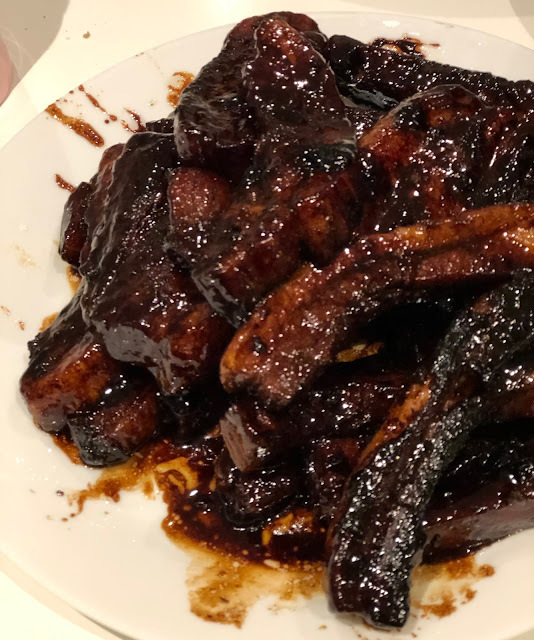 The result was version of Char Siew which the diners found satisfying. I can't say it is the best wok-cooked Char siew there is, but we were very happy with it. This I think should be the aim of home cooks. It lies less in learning more recipes, but in mastering the recipes you already know through learning to adapt to whatever ingredients and tools you have. Having succeeded in cooking it again in this London apartment, I am looking forward to th eversion I can cook in PJ. I will be using Malaysian pork: my favourite choice as it has the right sweetness, texture (never too hard and dry) and taste. Maybe one should say it is simply the version I grew up with. The rest of the ingredients will be a no brainer including the ubiquitous thick dark sauce. I will also be using my favourite iron work. Yes, a good plate of freshly made Char Siew done my Mum's way will be great on our CNY table. 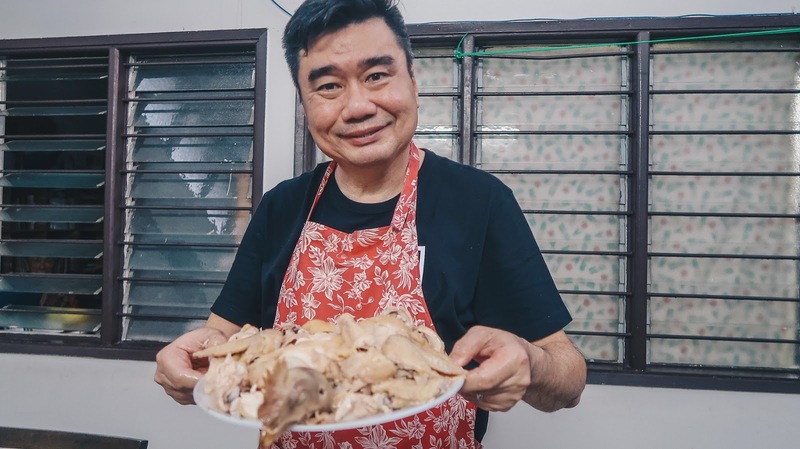 Stay tuned for my CNY 2019 planning notes for other Wong Family recipes. P.s. I do hope to do a cooking demo soon on Wok-Cooked Char Siew. If you are inserted, do indicate on my Facebook post here. This batch uses UK pork belly strips, skin off.